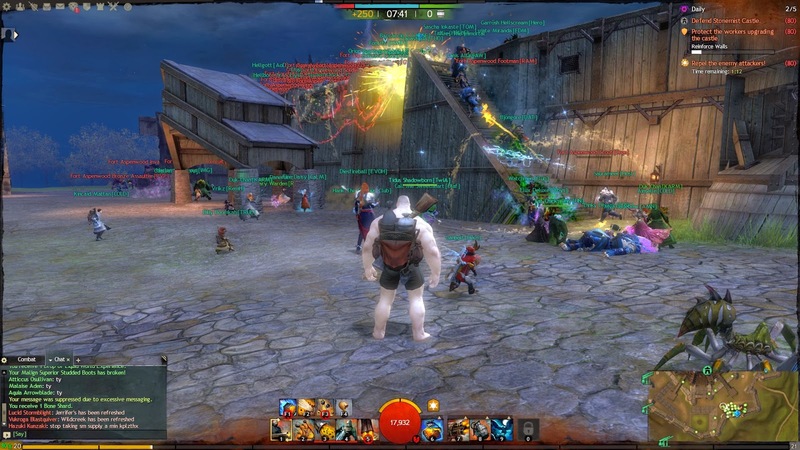 GW2 or The Zerg Lives! Games. Of course. I received Madden 25 and Call of Duty Ghosts. Both for the Xbox One. I still have to finish Dead Rising 3, so these should keep me pretty busy console wise. I also got a rechargeable battery kit for the XBox One controller. Books. I asked for and received one traditional book, Programming Google App Engine. Most of my projects use that platform, so it was nice to get a physical reference for it. I also got two books on CD: The Cold Commands by Richard Morgan and Under the Dome by Stephen King. These should keep occupied during my commute for quite a while. Roku 2. I already have a Roku, but my kinds have commandeered it to watch Amazon Prime movies. So I asked for a second one so I could watch Twitch live streams. Movie. I was given the Hobbit Blu-Ray as well. I had seen it in theaters, but I wanted to watch it one more time before seeing the sequel. Now I just have to make time to do that before the Desolation of Smaug stops showing. Amazon. I did get some Amazon gift cards too. These will surely be used quickly. I'm going to try to save them for future game purchases though. Clothes. What would Christmas be without some clothes? It has been a little while since I last blogged, but I am still alive and kicking. I expect my short hiatus to be over, now that the holidays are wrapping up. I can try to blame my lack of posts on the holidays, but it is mainly due to me not really playing anything. NoobistTV. This video and streaming project has been taking up a good chunk of my free time. It's still young and growing, albeit slowly. Galactic Starfighter. I did get a little SWTOR in recently. I found that I really stink at Galactic Starfighter. It's probably due to my control setup, as the n52te I use really isn't setup to handle the flight controls. Or maybe it is just me, although I remember being semi-decent at these sort of games. Hope you all had a good holiday (so far)! While I have not been playing as much as I'd like, I have been keeping myself with video games. Just in a different way. I love live streams as it gives me a way to be entertained by games if I am not able to actually play them. Live streams are long, so each video has a highlight list at the beginning. Just click on the highlight and you can jump right to it. I recently got a tip from a reader (Thanks Meh!) that WAR added items to the new vendor in the starting aread (and Chaos Wastes). At first, these vendors allowed you to purchase a boost up to 30/40. But with a couple of weeks left, they added two new potions. This one bumps you up to RR100! It also gives you 2,500 War Crests to help you gear up. It only costs 100 War Crests. If you don't have 100, 10 War Crests will get you a potion that makes you 40/80. 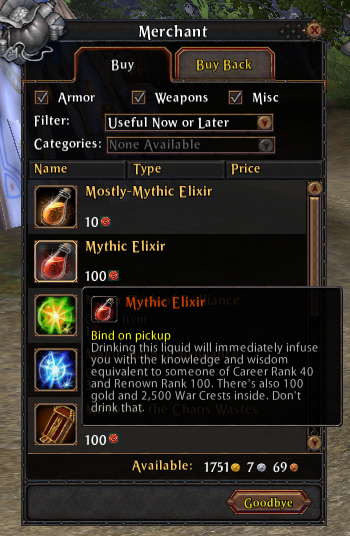 I'm not sure I'll use the RR100 potion. I made it to RR84 on my Engineer and I am fine ending the game with that. X Rebirth is suffering from its share of bugs. Most new games do, but XR seems to have more than its fair share. For example, trading. Trading is an integral part of the game universe, but it is on the buggy side at the moment. This has far reaching effects, including plot progression and trade empire building. In response, the developers have started a beta patch program. Players can get in development patches rather than wait for the fix. This is a pretty positive change. It gets EgoSoft more feedback and test support, and it gives anxious players something to chew on. To enable the beta version, open up Steam. Go to Library, find X Rebirth, right click on it, choose properties. Then you choose the beta tab and enter in: IBackedUpMySaves Then opt in! You should be all set. To turn it off, set the Opt In to None. Fair warning though, these patches may not be stable, so don't expect too much. I have been missing my pvp since leaving WAR. Plenty of games offer scenario type pvp, but I crave some RvR style gameplay instead. Mykiel recently live streamed some of Guild Wars 2, and I was intrigued. I played GW2 at launch, but it never stuck. I re-downloaded the client, and found out which server Mykiel was playing on. Turns out to be Stormbluf Idle... and a transfer to that costs 1,800 gems. Of which I have none. So I spent $35 on a pack of 3,000 gems and transferred my level 15 Norn Engineer. I also bought another bag slot and the Copper fed Salvage-o-matic which was on sale. WXP. One nice addition to the game is their World XP, which is like Renown. I really like earning regular XP and the World XP at the same time. During my play this afternoon I gained 4 levels of it. It's nice to get WXP drops as well, I got several +250 WXP potions. I also got my 1 year anniversary gift, which included a 'make me 20' potion so I used that too. People Everywhere. On to the PvP itself. It was jam packed! 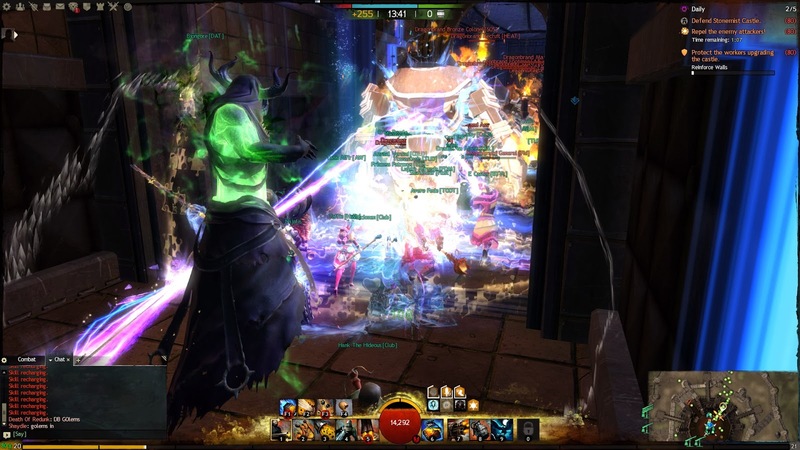 There were huge battles going on as we held the central keep while being attacked by both other realms. It's been a while since I've seen any really massive battles, so it was nice to see pvp alive and well again. Zerg. All the combat I saw was zerg on zerg, or blob warfare if you will. Without collision, it really just is masses of players tightly packed together clashing. I did the zerg thing as I was still trying to learn the game again. However, I don't feel as if I contributed in any meaningful way. Targeting and AoE. My biggest issue was I could not really target anyone. Between the mass of players on my side, the enemies, AND the mass of half-dead players from both sides I could not really get anyone targeted. That just leads to the dark side: AoE spamming. Maybe I am missing something though, as it seems AoE spamming is the order of the day. Performance. I was really impressed how well the game performed with the massive battles going on. Of course, my computer is pretty decent, but it still was a nice surprise. Long Term. 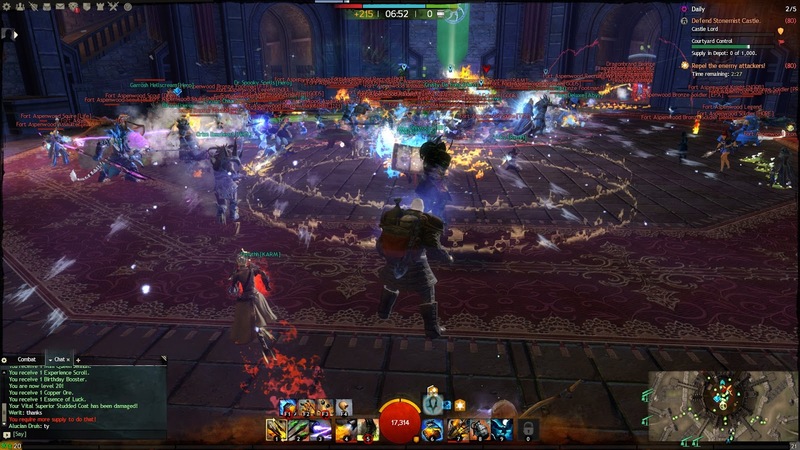 I'm not sure GW2 will keep my long term, mainly due to the zergy nature of it. Don't get me wrong, zerg is fun sometimes, but if it is the order of the day... I won't judge it based on one afternoon though.